I found this book on a Borders liquidation sale shelf. I picked it up for a couple bucks and have been meaning to read it out of curiosity's sake and see if it really was a bunch of heresy or if there was anything salvageable about it. What is unfortunate for Borders bookstore became my own good fortune. Now that I have a "Summer Break" from school, I decided to give it a read. As you know, I am a huge Donald Miller fan. Suffice it to say, Jay is not another Miller. I actually give this book 2 out of 5 possible stars for writing savvy. He tends to get stuck on one example and clobber you with it. It took me a total of 4 days to read the book, so the language is pretty straightforward. The chapters are short and easy to take in, that is a very convenient & a great positive for this work. A few sections, called grace notes, are anecdotes submitted by others used as illustrations. Those are fine, but some of the examples provided by Jay seem to be laced with bitterness. This furthers the rule of thumb that grace should also be applied to your illustrations because tone is difficult to nuance in print. Our works do not earn favor with God. Our works only come after we have been set free. In fact, we would not be able to do anything good without being set free first. 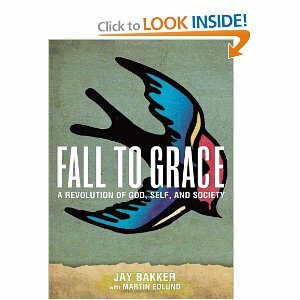 Jay runs the risk of Antinomianism--freedom to sin--with this book. He quotes Luther a lot and even goes as far as casting the apostle James in a negative light for being legalistic. (Remember that Luther wanted James stricken from the cannon of scripture.) Rather than working with the balance of scripture, Jay states that it is unfortunate that James speaks up to provide nuance to the grace & love that should flow from the Church. This dangerous flirtation with Antinomianism has lead Jay to accept all kinds of people into his church with no intention of correcting sinful behavior. Jay states that he would show how Homosexuals can be accepted into the Church without needing to change a thing about them, so long as they remain in a monogamous, loving partnership. Unfortunately, his arguments are just hyper-rationalizations of scriptural texts and standard rebuttals like: shellfish is also forbidden in the Old Testament & the word is not Homosexual, it is a male prostitute. In addition, he presents his church in contrast to such a closed-minded, fundamentalist, judgmental church as to amount to a straw man. Are there harsh, judgmental, fundamentalist, homophobic Christians in the Church today? Yes! Do they need to learn what grace is and how to use it? Yes! However, we should not focus so much on grace that we lose sight of holiness. Would I recommend this book? Yes, to certain people who will not be offended by it. I certainly would provide the warning that there is nothing in this book that should change your position on sin. But there are lessons to learn about dealing with people. People, no matter what they have done or are doing, should be treated with love, dignity and respect. In essence, Jay is asking that we not condemn each other. We should be open and honest with people. We should listen to people's stories and build relationships. Relationships are the key to the gospel. Jesus had real relationships with real people--even some grave sinners.